Hamas and Fatah agree to postpone the handover of Gaza from Hamas to Fatah amid continued disagreements over reconciliation. 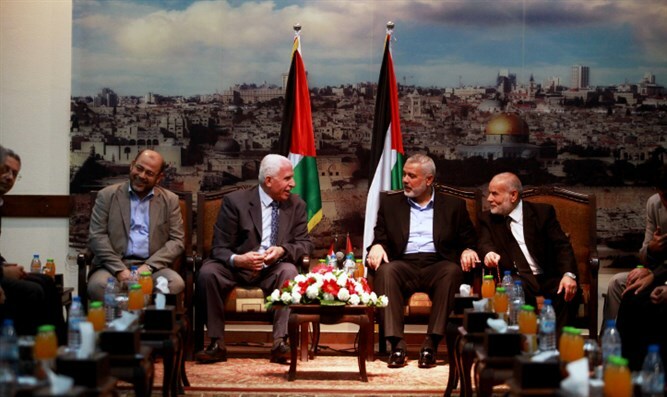 Hamas and Fatah agreed on Wednesday to postpone the handover of control over Gaza from Hamas to Fatah, AFP reported. The announcement comes less than 48 hours before a deadline for Fatah to assume control of Gaza which was part of an Egyptian-brokered reconciliation deal signed last month. The announcement came at the last minute as the landmark deal faltered dangerously, with Fatah and Hamas accusing each other of not respecting the accord. "Hamas and Fatah are asking Egypt to postpone the transfer of the government roles from December 1 to December 10 in order to finalize arrangements to ensure the completion of national reconciliation steps," said a statement from Hamas. Fayez Abu Eita, a spokesman for Fatah in Gaza, said the same in remarks after the factions met in Gaza City, noting it was in the interest of "achieving the goals of our people, achieving reconciliation and ending the division". Representatives of the Palestinian Arab factions, including Hamas and Fatah, met last week in Cairo to discuss the implementation of the reconciliation agreement signed last month. The talks ended in an agreement to hold new elections by the end of 2018. If held, the new elections would be the first in the PA in over a decade. Hamas has also repeatedly accused Fatah leader and Palestinian Authority (PA) chairman Mahmoud Abbas of thwarting the reconciliation efforts. Sharp disagreements remain between Abbas and Hamas, particularly over the fate of public employees in Gaza and security control of the enclave. Earlier on Wednesday, Fatah's top negotiator, Azzam al-Ahmad, told AFP that Hamas was "not committed to the agreement it signed in Cairo." "Until this moment, the problems and obstacles from Hamas are still there and are increasing," he charged. In response, senior Hamas official Bassem Naim accused Fatah of "maneuvers" to avoid going through with the deal. Also on Wednesday, in another sign of tension ahead of the deadline, PA employees were prevented by union delegates close to Hamas from returning to work at a number of ministries in Gaza. After Hamas took over Gaza in a bloody coup in 2007, the PA continued to pay around 60,000 staff in the enclave, despite the vast majority not working. Hamas has hired around 50,000 civil servants to replace them in the past decade, and the fate of those staff members is a key sticking point, with unions insisting on a settlement. On Tuesday, the head of the PA’s Ramallah government, Rami Hamdallah, called on employees of the PA to return to their former jobs in the Gaza Strip, with Hamas criticizing the move.